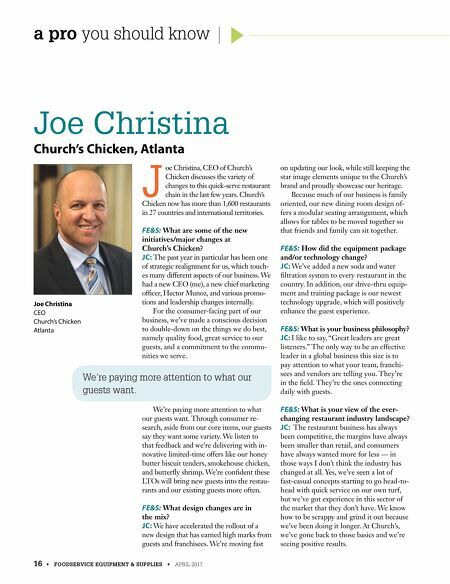 a pro you should know 16 • FOODSERVICE EQUIPMENT & SUPPLIES • APRIL 2017 Joe Christina Church's Chicken, Atlanta J oe Christina, CEO of Church's Chicken discusses the variety of changes to this quick-serve restaurant chain in the last few years. Church's Chicken now has more than 1,600 restaurants in 27 countries and international territories. FE&S: What are some of the new initiatives/major changes at Church's Chicken? JC: The past year in particular has been one of strategic realignment for us, which touch- es many different aspects of our business. We had a new CEO (me), a new chief marketing officer, Hector Munoz, and various promo- tions and leadership changes internally. For the consumer-facing part of our business, we've made a conscious decision to double-down on the things we do best, namely quality food, great service to our guests, and a commitment to the commu- nities we serve. We're paying more attention to what our guests want. Through consumer re- search, aside from our core items, our guests say they want some variety. We listen to that feedback and we're delivering with in- novative limited-time offers like our honey butter biscuit tenders, smokehouse chicken, and butterfly shrimp. We're confident these LTOs will bring new guests into the restau- rants and our existing guests more often. FE&S: What design changes are in the mix? JC: We have accelerated the rollout of a new design that has earned high marks from guests and franchisees. We're moving fast on updating our look, while still keeping the star image elements unique to the Church's brand and proudly showcase our heritage. Because much of our business is family oriented, our new dining room design of- fers a modular seating arrangement, which allows for tables to be moved together so that friends and family can sit together. FE&S: How did the equipment package and/or technology change? 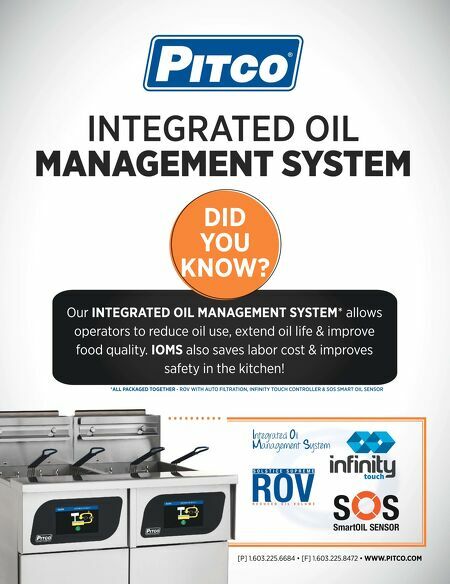 JC: We've added a new soda and water filtration system to every restaurant in the country. In addition, our drive-thru equip- ment and training package is our newest technology upgrade, which will positively enhance the guest experience. FE&S: What is your business philosophy? JC: I like to say, "Great leaders are great listeners." The only way to be an effective leader in a global business this size is to pay attention to what your team, franchi- sees and vendors are telling you. They're in the field. They're the ones connecting daily with guests. FE&S: What is your view of the ever- changing restaurant industry landscape? JC: The restaurant business has always been competitive, the margins have always been smaller than retail, and consumers have always wanted more for less — in those ways I don't think the industry has changed at all. Yes, we've seen a lot of fast-casual concepts starting to go head-to- head with quick service on our own turf, but we've got experience in this sector of the market that they don't have. We know how to be scrappy and grind it out because we've been doing it longer. At Church's, we've gone back to those basics and we're seeing positive results. Joe Christina CEO Church's Chicken Atlanta We're paying more attention to what our guests want.